Airport design by NAPS (Freddy De Pues). This version 5.0 is brand new from scratch.v It’s in real the homebase of the F-35. 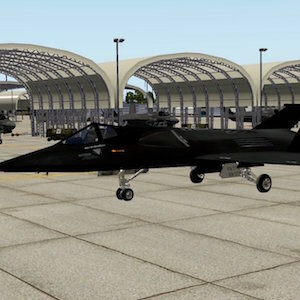 Destin–Fort Walton Beach Airport (IATA: VPS, ICAO: KVPS, FAA LID: VPS) is an airport within Eglin Air Force Base, near Destin and Fort Walton Beach in Okaloosa County, Florida. No private aircraft are allowed, so Destin Executive Airport is used for non-commercial operations. The airport was called Northwest Florida Regional Airport until February 17, 2015 and Okaloosa Regional Airport until September 2008. Destin–Fort Walton Beach Airport is served by the regional airline affiliates of American Airlines, Delta Air Lines and United Airlines which fly nonstop, mainline and regional jets to hubs in the southern and eastern United States. Delta Air Lines mainline jets also fly to its hub in Atlanta, while Allegiant Air flies mainline jets to St. Louis and its midwest base in Cincinnati. In 2008 the FAA recorded over 373,808 enplanements at the airport (Courtesy of WikiPedia). NAPS HD fully customized scenery (SketchUp & Blender), extremely detailed, animations, including some of Marc Leydecker’s © assets. Terminal, King Hangar, Museum, by Hans Gindra, new textures by Freddy De Pues. New MB2 tractor and Mercedes mil animated tanker (Belgian Air Force) by Marc Leydecker. Tweaked orthos, courtesy USGS, for better immersion in XP environment. Feathered contours. Different layers in PhotoShop for different grass or forest areas, courtesy Marc Leydecker. Static F-35B ©objects by Fabrice Kauffmann (AOA Simulations). Ready for “Static aircraft in parking spots” by Austin.